NutleyWatch “News Capsules” are a new series of iterative articles intended to help readers research and get up to speed on issues more quickly and easily. News Capsules are companion articles, and are meant to complement our own proprietary content here on NutleyWatch.com. Together, they provide a much more complete, 360-degree overview of a particular issue. In this first News Capsule, you will find links to information that is relevant to the Second River Station development proposals. This project is also formerly known as the Imagine Center or Northeast Redevelopment. These enormous residential development plans are for the 28-acre combined Jacobs/Walter Kidde properties in Belleville, situated in “The Valley” between Washington Ave and Main Street, and are being proposed by the Belleville Development Group (BDG) and Maser Consulting. This first draft is not meant to be an exhaustive list; just the beginning of something that will eventually grow to become such a resource. New information will be added, and old information amended, as more details surface or are acquired. If you happen to find a directly relevant news article or media item that is not listed here, please let us know via the Contact page so that we can include it here for others. **Update** At yesterday’s Belleville Town Council meeting (3/24/15), the Council voted unanimously to reject the Second River Station development proposal. The people have spoken, and the Council was listening. Their answer was a resounding, “Hell no”. Another huge victory for conscionable governance and community advocacy in Belleville. – Note that by his own stated credentials, Mr. Ahlstrom went from being the marketing analyst for an assisted living facility, to working a one billion dollar international land development deal in Belleville. – The source and context for this sales presentation is unknown at the moment. Since it was translated for Mandarin Chinese, it may have been used to help secure funding from overseas investors. When that specific claim by Mr. Ahlstrom was brought to the Council’s attention by Mr. Vincent Frantantoni at the March 10, 2015 Belleville Town Council meeting, Mayor Kimble responded by telling the public, “That’s wrong. That statement is wrong”. 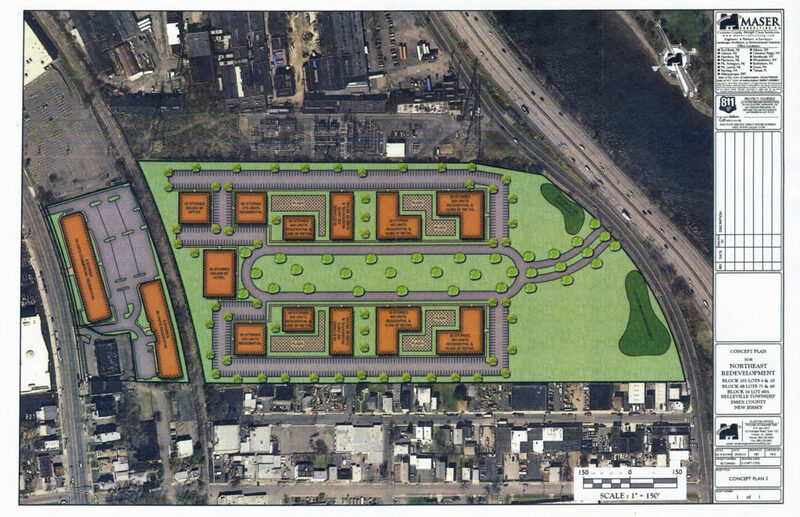 The original August 2014 proposal, reviewed and unanimously approved by the Belleville Planning Board on November 13, 2014. Note that the bulk of the property is not zoned for residential. It is zoned for planned retail/commercial and light industrial. To pull off this development would require flipping the zoning. With several issues to consider about the immediate area and its suitability as living space, watch for any potential zoning changes, which should be scrutinized very closely. Also note that Belleville’s own Master Plan states that in the proposed area along Washington Avenue, “mixed use high density housing buildings can be eight stories in height and have a density of up to 50 dwelling units per acre provided certain conditions are met”. Meanwhile, the grand plan for Second River Station, “Option 3”, includes multiple buildings from 35 to 50 stories in height, and a density of 250 dwelling units per acre, according to their proposal. I’m no math wizard, but that seems to exceed the restrictions imposed by the Township Master Plan by quite a huge margin. The B-G Zone on the left is zoned for mixed use Commercial / Residential. The B-F Zone on the right, where the bulk of the development will occur, is zoned for Planned Retail and Light Industrial. Not Residential. 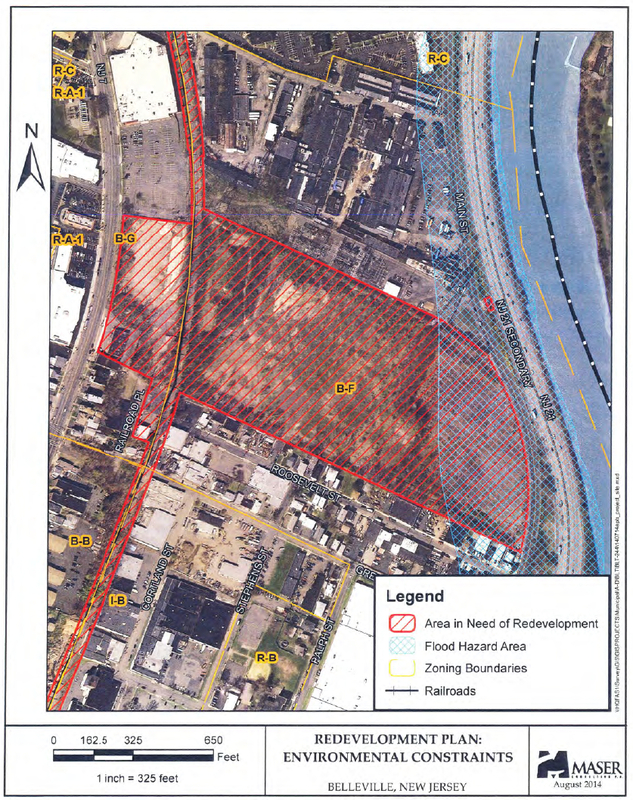 Note the blue mesh area marking the declared Flood Hazard Zone. For orientation, Washington Avenue is on the far left side of the map. Main Street and Route 21 are on the right side of the property. About two blocks north of this location is Park Ave, and the Nutley/Lyndhurst Bridge across the Passaic River. Directly abutting the north side of the site is the PSE&G utility right-of-way station. 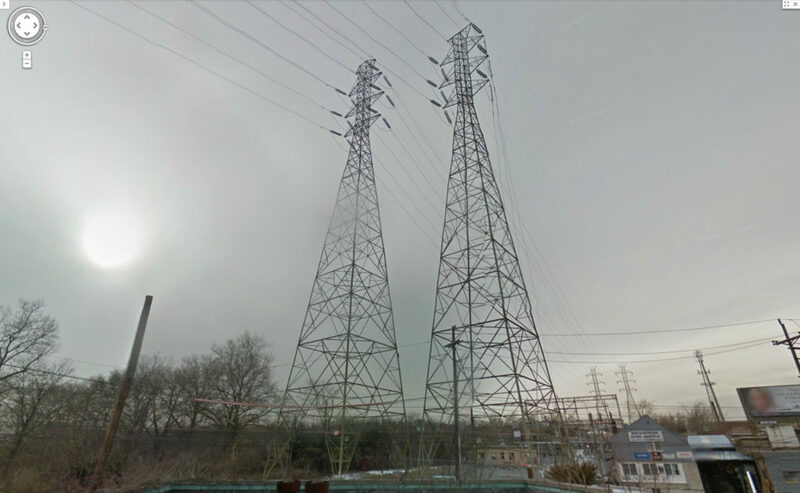 Clearly visible are the nearly 200-foot-tall high voltage power transmission towers from the NorthEast Grid Reliability Project, for which PSE&G reportedly spent nearly $1 billion. Looking west from Route 21 down the north border of the Walter Kidde property. According to PSE&G, these transmission towers transmit 230,000 volts of power. No official word anywhere that we have found on how the developer specifically intends to deal with residents living in close proximity to high voltage power transmission lines. Review the concept map above to see just how close. No information offered on the many studies concerning the effects of EMF (Electric and Magnetic Fields), or the documented health risks of living near power lines. We would be very happy to provide clarification here, should the developer offer any further concrete information to the public. Among other things, pay close attention to page 16. This chart on Transit-Oriented Developments (TODs) appears to be the specific argument in support of the developer’s claims that 4500 new families would have only a negligible impact on the Belleville school district’s student population. Except, we’re not sure how applicable this theory and these findings, assuming you find them believable, would even be. First of all, Belleville is simply not Jersey City or West New York. However, let’s set that obvious fact aside, and look at what a Transit-Oriented Development really is. A transit-oriented development (TOD) is a mixed-use residential and commercial area designed to maximize access to public transport, and often incorporates features to encourage transit ridership. A TOD neighborhood typically has a center with a transit station or stop (train station, metro station, tram stop, or bus stop), surrounded by relatively high-density development with progressively lower-density development spreading outward from the center. TODs generally are located within a radius of one-quarter to one-half mile (400 to 800 m) from a transit stop, as this is considered to be an appropriate scale for pedestrians, thus solving the last mile problem. Now let’s discuss the proposed Second River Station site as an “area designed to maximize access to public transport”. At this time. there is no commuter rail service station in operation at or near the Jacobs/Kidde property. Despite the developer’s promises, there is no guarantee that a commuter conversion of the nearby Conrail freight line – which by the way is a single track – would ever become a reality. Not that it connects to Hoboken or Manhattan anyway. Delawanna Station in Clifton is over two miles away, “as the crow flies”. That is well over the half-mile maximum expected walking distance of pedestrians to qualify as a transit stop for a TOD. The Silver Lake Station on the Newark Light Rail line is over two and a half miles away, also as the crow flies. There is a bus stop nearby on Washington Ave, which is serviced by multiple New Jersey Transit bus lines. These lines offer service into Newark, and connect to other mass transit access points both north and south, like Nutley Roche and Clifton Commons, where commuters can then switch to another transit line. To our knowledge, none of these bus lines at this bus stop near the proposed site offer direct service into Manhattan. Why exactly is that important? There are no NJ Transit rail stations nearby, or even within the half-mile radius described by the TOD definition above. No PATH stations. No ferries. Being able to acquire the Conrail freight line, and somehow convert it into a viable commuter line (again, with one track) is an incredibly huge assumption. Therefore, such an assumption hardly seems a valid basis for marketing this as a Transit-Oriented Development, and arguing its potential appeal as such. Not to mention that Jersey City for example is undergoing an enormous series of Transit-Oriented Development projects already in progress. How will this project be able to compete with those, when they have not only the immediate proximity to New York City just across the river, but also the remarkable mass transit infrastructure that Jersey City is renowned for already in place? The Jacobs/Kidde site in Belleville having bus stops as well as convenient access to several highways certainly counts, of course. However, those are a common attribute of not only all of Belleville, but virtually every township in this entire area. Therefore, what exactly qualifies the Second River Station project as a Transit-Oriented Development as defined above, as opposed to simply another garden variety, high-density residential development project? The competitive aspect aside, this question is important to us for several reasons, but perhaps none so important as this one for residents of this town. If this project is not considered a competitive, legitimate Transit-Oriented Development, then logically it may not attract the specific target demographic the developers are claiming, and on which the entire proposal they’re pitching is based. If that target demographic is not reached, then logically the specific Rutgers study findings are not applicable, nor are the student increase estimates. For this project to be touted as a Transit-Oriented Development, it is our opinion that everything is predicated on a gigantic assumption, which is the acquisition and development of the Conrail freight line into a viable commuter line that can ultimately bring commuters to New York City. Virtually everything that the developer claims about the viability or desirability of this project is based solely on the central promise of something that no one can remotely guarantee will ever happen. Therefore, until at least a deal for the rail line is secured and a realistic plan is developed for its construction, no one can stand before the public and with a straight face, tell the residents of Belleville that this is a Transit-Oriented Development, and therefore it will only add one (1) public school student for every fifty (50) families living there. Or by mathematical extension and the developer’s own testimony, convince the township that 4500 new families introduced to Belleville will increase the already overcrowded school district population by only 90 children. To any reasonable person – other than a developer perhaps – such a statistical projection for Belleville sounds ludicrous beyond belief. Even if you can believe the empirical data provided by the 2006 Rutgers study and the projected impact on the school district, it is our strong opinion that the entire application of the study itself as it relates to this project is flawed or grossly presumptive to begin with. Their own argument in support of such data doesn’t hold water, as it is entirely based on something that simply cannot be guaranteed. 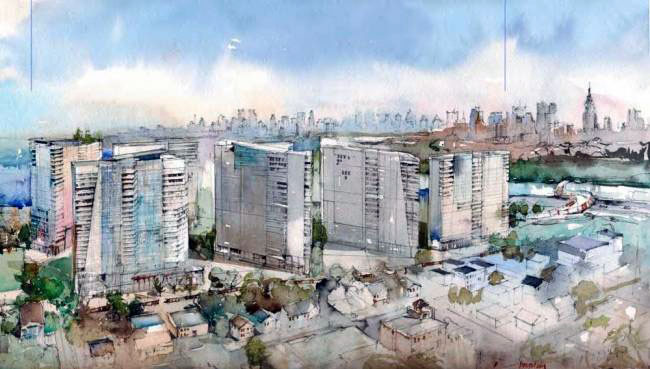 If the Second River Station project doesn’t have the transit options and the “maximized access to public transport” to be considered a bona fide Transit-Oriented Development, and the desirability of such, then logically it will not attract the people who desire a highrise TOD lifestyle. This of course means that the Rutgers study findings would not be applicable in this scenario. Therefore, the developer’s promises of a minimal impact on the student population of the Belleville school district is nothing more than conjecture and a smooth-talking sales pitch. The true impact on the school district is a wholly unknown, yet all important variable that cannot be dismissed as easily as the developer would have you believe. I apologize, that was a rather long way to go to make a simple point, but it was necessary. For now, the information provided in this post is all the public knows about the Second River Station project, all of which had to be collected and pieced together by the community. Thank you to all contributors, many of whom were anonymous, so they could not be thanked by us personally. This post will be updated as new information becomes available to the public. You’re off to great start Griff. Very impressive- eager for more!